Daniel K. Inouye in Asian and Pacific Islander Americans in Congress, 1900-2017. Prepared under the direction of the Committee on House Administration by the Office of the Historian and the Office of the Clerk, U.S. House of Representatives. Washington: Government Publishing Office, 2018. Goodsell, Jane. 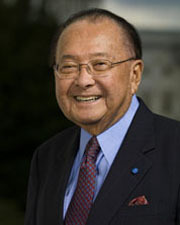 Daniel Inouye. New York, NY: Crowell, 1977. Inouye, Daniel K., with Lawrence Elliott. Journey to Washington. Englewood Cliffs, NJ: Prentice-Hall, 1967. Smith, Larry. Beyond Glory: Medal of Honor Heroes in Their Own Words. New York, NY: W.W. Norton & Company, Inc., 2003. U.S. Congress. Memorial Addresses and Other Tributes. 112th Cong., 2nd sess., 2013. Washington, D.C.: Government Printing Office, 2013.